Employees can cancel receipts. What can I do to have a control over all cancelled receipts and given discounts? Each cancelled receipt and given discount are recoreded to the system and are visible in section Receipts, subsection Control of cancellations and discounts. You can search for receipt by the date. For each receipt you can see its date, amount and possible loss, all those information help to control whether the receipt was correctly cancelled. If you think that receipt was improperly cancelled, in the same subsection you can bring it back to the system or completely delete it (only from account OWNER). I made a wrong order (I ordered one item more) and it was already printed. Can I cancel it somehow? 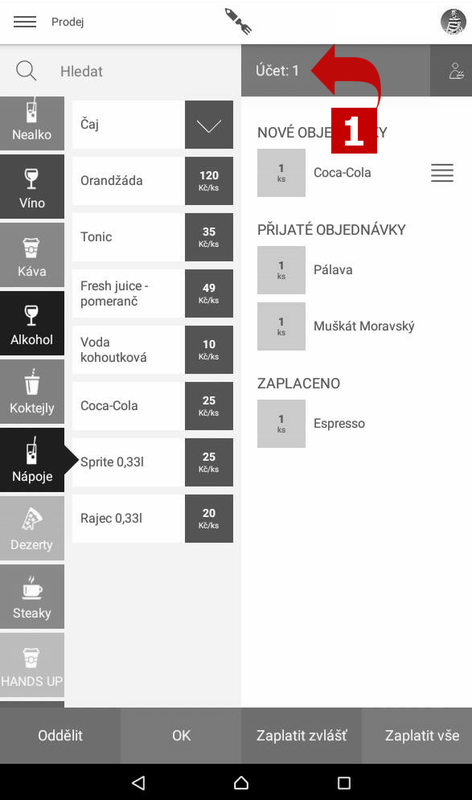 Printed receipt can be immediately cancelled in mobile waiter’s application POS in List of receiptsPřehled účtenek or in Web Network Administration in section Receipts, subsection Control of cancellations and discounts. After printing the receipt, guest realises that has no money and wants to pay by card. How to change the method of payment? Click on the three horizontal lines on the upper left corner and select Receipts list. Find the bill, which we reprint, click on it and then click on paid: Cash (or Card). After that select the form of payment that actually took place. If order is confirmed you can delete the item when holding a finger on the item and then click on +/- or click on the number and set the amount on the calculator. When you set the 0, the item dissapears from the account. If you want to delete the whole account, click on the heading of the account (1) and choose „Smazat účet“ (2). Warning: There is no another following confirmation, the account will be deleted right after this action. Already printed bill you can cancel in section Přehled účtenek by clicking on „Stornovat účtenku” after choosing the right bill. If the reason to cancel is set, you need to choose the reason as well. If your customer left without payment, or in case of personnel account you can use button vydáno nezaplaceno. It means, that the items will be deducted from the stock and the revenues will be nut recorded so no bill will be printer. Click on an acount/ Účet: Tab1. And on the dialog choose „Vydáno – nezaplaceno“. The last step is to confirm the action. Note: It is not possible to take the action back! The cancellation is in competence of every user of the Storyous POS. All the items and accounts, which has been cancelled after the order was confirmed are registered in the web administration in the section Kontrola storna a slev -> Podniky - more info in the article Kontrola storna a slev to which has access only the OWNER. In tablet you can make cancellaion withich 24 hours in section přehled účtenek, then click on given bill and choose Storno.If you set the reason for cancellation/důvody zrušení účtenky in web administration, waiter needs to fill the reason too. Cancellation is sended to RI portal as a negative bill.